Apparently cooking with slow cookers is totally “in.” Admittedly, the idea of just throwing a bunch of ingredients into a big pot and letting it cook, without having to stir, flip, etc was very appealing. Fortunately for me, I had just gotten a copy of Lucky Leaf’s Sweet & Hot Slow Cooker Pork recipe (also posted below.) Doubly fortunately for me, I was able to hunt down a slow cooker. I mean – I wasn’t going to go out and buy one without “testing” out the concept, right? I’ve enjoyed using Lucky Leaf pie fillings for more than just pies before. Whether it was creating toppings for a patriotic cake or for baking up a delicious back of cookies, I’ve learned to look beyond the words “pie filling” at the endless possibilities of things you can cook with Lucky Leaf. This time around, I went savory with this slow cooker pork recipe. I did modify the recipe a little for my taste. I had no idea where to find canned chipotle chile peppers in adobo sauce, so I used a little bit of chopotle chile peppers in my spice rub. I also swapped out sweet potatoes for regular potatoes. I rubbed the pork cholder with the spice rub, put it in the cooker and topped it with the onions, potatoes, and finally the Lucky Leaf apple pie filling. It LOOKED like it was going to be delicious. I put on the lid, turned on the slow cooker, and seriously in a matter of minutes it SMELLED like it was going to be delicious. I checked in on the pork a couple of times and did baste it a little bit during the process to help that nice flavor throughout the pork. “Now THIS smells like good home cooking,” someone said as they walked in. You can’t have food that looks and smells that good and wait for more than a few hours, so we cranked that slow cooker up to high and in 4 hours, it was ready to serve. It was so tender that people were walking by just grabbing chunks of pork off the bone and eating it. Literally grabbing pieces of pork and apple with their fingers. Finally I served it all up and it got rave reviews. The recipe is top notch and the flavor – oh! the flavor! – was amazing. 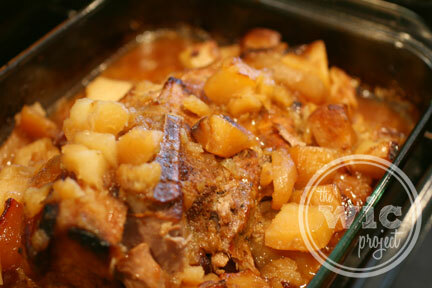 The sweetness of the apples and the hint of onion with the tenderness of the pork just worked so well together. I’m sure if I had used the chile peppers as directed there would have been more heat, but for me it was just perfect. 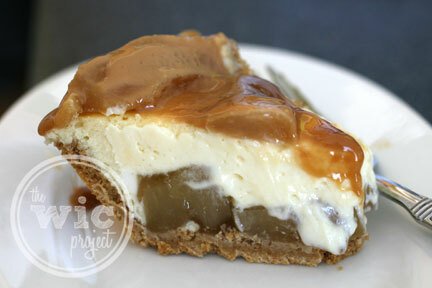 We followed up with a caramel apple cheesecake, which had Lucky Leaf pie filling at the bottom and as a topping (recipe to be posted shortly.) Talk about a double dose of deliciousness. The apples from the pie filling blended with the caramel for the topping just took it over the edge. The next time you’re thinking up some dinner ideas, don’t forget that Lucky Leaf pie filling is a versatile ingredient that can add that extra pizzazz to your meal! 1. Lightly coat a 5- to 6-quart slow cooker with nonstick cooking spray. In a small bowl, combine chipotles, salt, pepper, and paprika. Rub mixture over the pork. Place pork in the slow cooker. Top with sweet potatoes, onion and pie filling. 2. Cover; cook on low-heat setting for 6 to 8 hours or on high-heat setting for 3 to 4 hours. 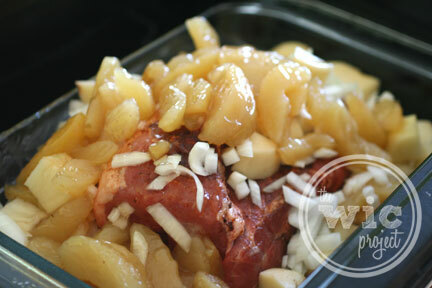 Remove pork and apple mixture from slow cooker. Cover with foil and let stand 10 minutes. Transfer cooking liquid to a medium saucepan. Stir together 1/4 cup water and 3 tablespoons flour. Add to saucepan. Cook over medium-high heat until mixture is thickened and bubbly; cook and stir 1 minute more. 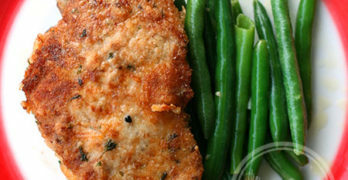 Slice pork and serve with apple mixture and thickened sauce. *Because hot chile peppers, such as chipotles, contain volatile oils that can burn your skin and eyes, avoid direct contact with chiles as much as possible. When working with chile peppers, wear plastic or rubber gloves. If your bare hands do touch the chile peppers, wash your hands well with soap and water. Disclaimer: This post consists of my (and/or fellow tester) opinions only. Your experiences may be different. No compensation was given for this review/giveaway. I did receive a free product and a gift card from the manufacturer or their representing PR agency to use and test for the purposes of this review. This did not affect the outcome of this review. I’m going to have to give this one a try! It sounds easy and looks wonderful! 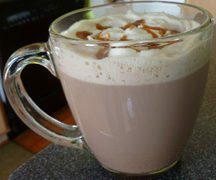 yummy this i kidda try..